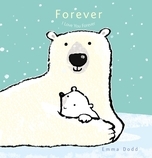 Love between parent and child lasts a lifetime – the beautiful message in Emma Dodd’s Forever. Featuring stunning illustrations of a polar bear family and with interior pages embellished with foil, this makes a handsome addition to any nursery bookshelf and is the perfect book for parent-child bonding at bedtime. How long does a parent’s love last? Forever! Emma Dodd has created a host of books to critical acclaim. She works from a studio in Surrey, England. When not working, Emma and her family spend as much time as they can in North Cornwall, surfing and walking in all weather.